You’ve heard of hyperbaric oxygen therapy before, and perhaps you know a friend or family member who used the alternative treatment and loved it. You have a stubborn injury yourself that you’d love to heal using HBOT, but you’re wondering how to afford it. This leaves you wondering, Is hyperbaric oxygen therapy covered by insurance? Fortunately, if you find the right clinic, the answer is yes! You shouldn’t have to pay out of pocket for a life-changing or limb-saving medical treatment, and thanks to hyperbaric specialist clinics like R3 Wound Care and Hyperbarics, you don’t have to. How Is Hyperbaric Oxygen Therapy Covered by Insurance? 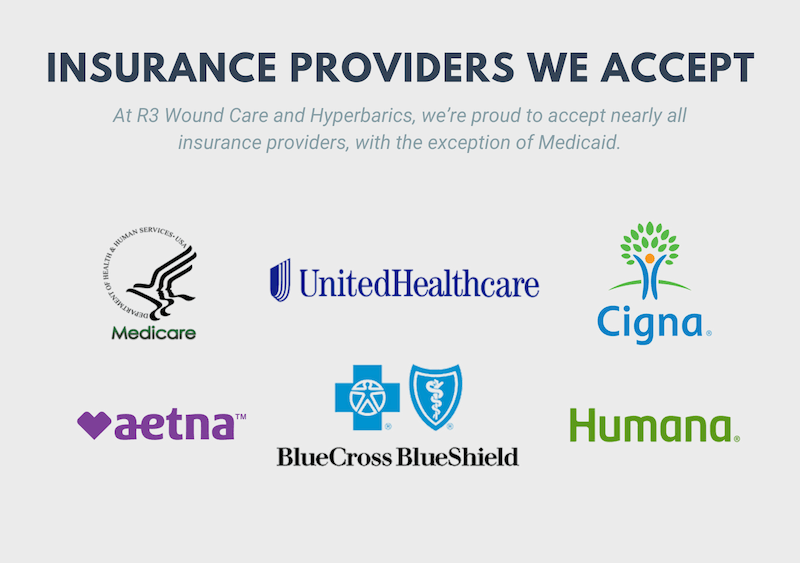 Here at R3 Wound Care and Hyperbarics, we’re proud to accept nearly all insurance providers, with the exception of Medicaid. We believe that the best alternative treatments should always be affordable for our patients, so we strive to accept all insurance providers instead of cash or private payments. With the opportunity to use your insurance coverage to receive HBOT care, you can receive a series of treatments just with the low cost of your insurance co-pay. You don’t need to stress about affording each treatment out of pocket or making a payment plan arrangement that puts you into debt. Instead, your insurance foots the bill, and you get to enjoy the results! Diabetes affects wound healing because chronically high blood glucose impairs the function of white blood cells. Minor wounds, cuts, and burns that non-diabetic adults might ignore can cause serious health issues for those with diabetes. Without powerful white blood cells to unleash at the time of injury, your body fails to efficiently fight bacteria. Diabetes also causes poor circulation, which slows the flow of red blood cells and makes it even more challenging for wounds to receive the oxygen and nutrients they need to heal. To make matters worse, diabetes causes nerve damage that diminishes awareness of injuries, especially on the feet. As a result of these complications, adults with diabetes often experience wounds that can’t heal. HBOT has become a leading treatment for diabetic wounds because it delivers enough pressurized oxygen to stimulate the white and red blood cell actions needed to support healing. Chronic wounds take an excessively long time to heal, and some never heal or recur quickly. These kinds of injuries have a serious impact on your quality of life and overall health, yet few traditional medical treatments address the root cause of inefficient healing. HBOT addresses chronic non-healing wounds by increasing the supply of oxygen delivered to wound sites. As soon as pressurized oxygen starts streaming through the blood, it stimulates and supports the body’s own healing process. White blood cells receive enough oxygen to effectively kill bacteria, reduce swelling, and allow the rapid reproduction of new blood vessels. Any abscess is defined as a swollen and infected portion of body tissue that accumulates pus and bacteria. They can develop anywhere from the skin or mouth to internal organs. An intracranial abscess is an especially life-threatening infection caused by bacteria from an ear infection, abscessed tooth, or sinus infection. As soon as those bacteria invade brain tissue, they prevent normal brain function and place your life in jeopardy. Only a strong antibiotic and HBOT can reverse this type of abscess. Many patients seek out HBOT to stop or reverse gangrene, which is the death of body tissue due to a lack of blood flow or a serious infection. You may suffer gangrene when bacteria enter a surgical incision or a wound caused by injury. If you have diabetes, atherosclerosis, or peripheral vascular disease, you’re automatically more vulnerable to gangrene. Fortunately, hyperbaric oxygen therapy is often covered by insurance to treat gangrene. Hospitals used to offer the majority of HBOT treatments, but it’s now possible to walk into a free-standing clinic to enjoy the advantages of hyperbarics outside of a hospital. HBOT medical care in a clinic like R3 helps you receive the care you need at a much lower cost. You don’t need to worry about paying for a hospital room or extra doctor’s fees. Instead, a clinic like R3 offers state-of-the-art comfort and technology. The oldest R3 clinic in Dallas Fort-Worth, Texas isn’t even three years old! The buildings are so modern, spacious, and clean that you won’t even know you’re in a clinic at all. When you can find an HBOT clinic that offers more advantages at a lower cost than hospital facilities, the decision is easy to make! Does Your Insurance Cover HBOT? How Can You Find Out? Each insurance company handles HBOT differently. Some only handle specific conditions, like diabetic ulcers or gangrene, while others don’t specify. When you come to R3 for your treatment, all you need to do is hand your insurance card over to a staff member, and we handle the responsibility of digging into the details of your policy. By the time you’re done with your evaluation, we’ll be able to explain exactly what type of HBOT coverage your insurance company provides. We’ll even talk to your insurance company to fully understand their flexibility, terms, and rules. If you want to know more about your health insurance HBOT policy, simply call into or visit one of our three R3 clinics in the DFW area. We’ll gather all of the information you need to take the next steps! While most insurances do cover hyperbaric oxygen therapy, your specific insurance policy might not cover the reason for your treatment. For example, most policies don’t cover Lyme disease, and some only cover five treatments at a time contingent upon your doctor’s evaluations. If you find yourself in the position of needing a treatment we can’t offer through insurance at R3, we’ll always help you locate a clinic in our area that does accept cash payments. Our number one mission is to help you improve your health, comfort, and safety!